Maruti Suzuki has launched its latest product in the market, the Ertiga and for sure it will be a volumes puller. The fact that there are not many MPVs in the market drew our attention and for you readers, we compared the Maruti Ertiga with Mahindra Xylo. In continuation with our car comparison series on Car Blog India, we are going to compare the Maruti Ertiga MPV with one of the most popular MPV in India, the Toyota Innova. 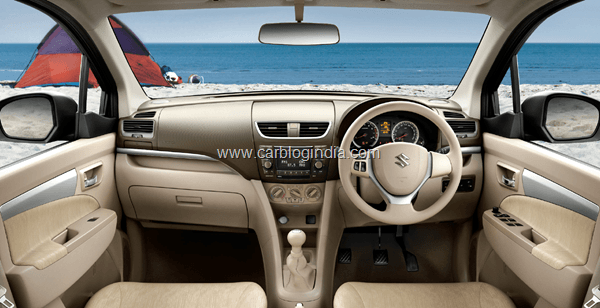 The Ertiga is the latest addition and Maruti is hoping it to be hit. The styling is different, though the front face looks derived from Maruti Ritz and reflects 2011 Maruti Swift too. Nice big headlamp cluster, sharp body lines, flared wheel arches, differently styled tail lamps and much more. All in all the car is nice to look at and does not feel awkward in proportions. Also the car has a good overall built. The Innova has recently been restyled and the 2012 model looks more contemporary now. The headlights now resemble Toyota Camry’s headlights and even the grille and hood looks better. 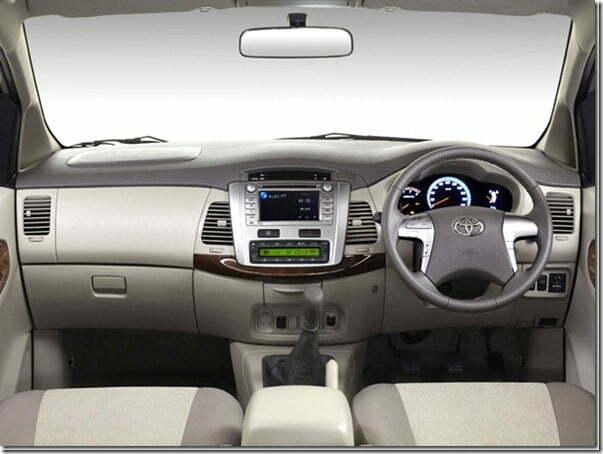 If you talk about the built of the car, Toyota has never compromised on it and Innova is no exception. So if looks are your prime concern, I am sure you will find it difficult to make a choice between the two. Proportion wise there is a remarkable difference in the width and height of the two cars, with Innova leading the Ertiga. In fact the Innova is longer as well but in spite of the extra length, there is hardly any difference in the wheelbases of the two. The Ertiga is new and refreshing and comes with killing dual tone interiors and interesting features. Even the fit and finish, as compared to the previous generation models, is not bad at all and in fact it feels good enough. The two tone colour theme suits matches the contemporary styling of the dashboard. Features being offered include ABS (LDI only), Manual AC, Engine Immobilizer, Power Steering, Internally adjustable ORVM (Manual), Accessory Socket, 60/40 Spilt seats (2nd Row seats with seat slide), Tilt Steering, Retractable cup holder, Body coloured bumpers, Low fuel warning lamp, Door Lock canceller(front), Twin AC, Security alarm system (Door+ Hood), Tachometer, Front Fog Lamp, Audio+CD+USB, Speakers(FRX2+RRX2), Seat back pocket(Co-driver side), Rear Centre Armrest(w/o cup holder), Front & Rear Power windows, Driver ‘s side power window auto down, Coloured outside door handles & ORVM, Remote Keyless entry, ORVM Mounted turn indicators etc. Although Toyota brought some changes on the exterior of the Innova, the interiors were still not touched much. Only a couple of new features were introduced Rear Defogger , Front Fog Lamps, Outside Rear View Mirrors (Colour / Control), Rocker & Door Lower Moulding, MID (Multi Information Display), Optitron Combimeter With Illumination Control , Tachometer , Door Ajar Warning , Seat Belt Warning, Front Map Lamp (With Overhead Storage Console) , Power Outlet (DC) 12V, Glove Box , Sunvisor (Driver), Sunvisor (Passenger) , Wooden Panel (Wood-like Finish), Driver Seat Height Adjustment, Air Conditioner, Heater, Rear Air Conditioner Ceiling Vents (For 2nd & 3rd Rows), Tilt Steering Column, Power Steering , Power Windows (With Driver side Auto Down), Power Door Lock, Audio System, Speakers, Microphone + Amplifier, Audio,Mid & Bluetooth Phone Control on Steering, Keyless Entry, Back Monitor Camera with Display , GOA Body, ABS , SRS Airbags, Immobilizer etc. In terms of features both the cars do not have much difference but when it comes to space, the larger proportions of Innova help the car beat Ertiga. 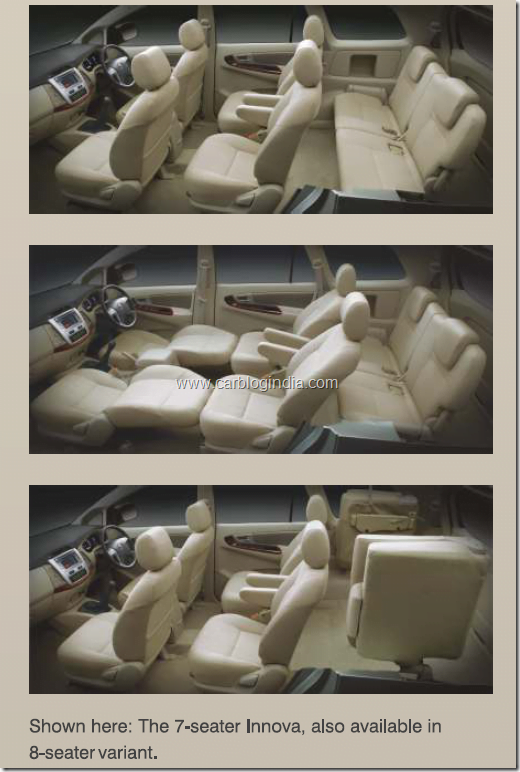 Another thing is that Innova’s interior plastic quality is better than Ertiga’s interior plastic quality. A good Diesel engine is known for its torque output and fuel efficiency. Luckily the Ertiga’s 1.3 litre unit, despite being smaller, puts out 200 Nm and delivers 20.7 KMPL. Though the torque figures are the same, there is a significant difference of 8 KMPL in the mileage of the two cars as the Innova delivers only 13 KMPL. Also the pickup of Ertiga would be better as it has the same torque output and weights 435 Kg less. The Ertiga is based on Swift’s platform which means that it handles really well and a fun to drive car. Be it sharp corners or straight road, the Ertiga is a confident car. The Innova is also a great handler with car like handling and comfortable driving position with an easy to operate steering wheel. But because of its lower weight, agile movements and lower height, Ertiga feels more confident on higher speeds and sharp turns, so Ertiga comes out to be a better handler overall. From the price point of view both cars cannot be compared as there is difference of approximately Rs. 2 lakhs in the base model of Innova and the top end Ertiga which is quite a lot. The base LDi diesel comes with minimum features excluding Audio system, dual airbags, ABS and many more and is priced at Rs. 7.3 lakhs. The base Innova is priced way ahead and again comes with similar features and there is nothing remarkable except for the extra space and comfort level. A similar difference prevails over the entire variant line-up. If you consider the top end Ertiga ZDi at 8.45 lakh INR and the base 2.5 EV Innova priced at 9.18 lakh INR, you would notice that the top end Ertiga offers much more features than the Innova EV. ZDI comes with ABS, dual airbags, audio system, power adjustable outside mirrors with turn indicators, steering mounted switches and many more features which are not there in Innova EV. First of all if you are considering both the models, please test drive each of them. Now coming to the verdict, the Ertiga is better in fuel efficiency, pricing, and handling. 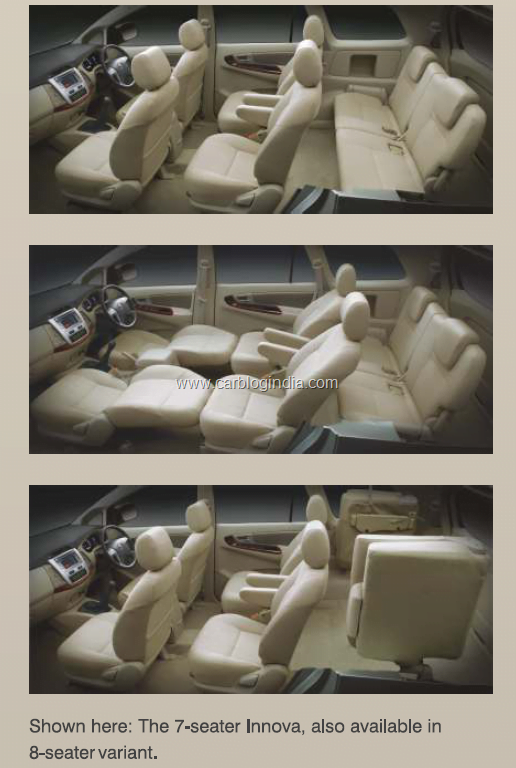 The Innova on the other hand is spacious and more comfortable but also costs more. Now there are many factors which could influence your decision, if you like spacious cars and are willing to pay more for the space and comfort, you would love Innova. Whereas if you are very price conscious and do not have a big family which demands more space and also want a value for money car, the Ertiga is better choice. To our understanding, for most small families, the Ertiga is a much more practical car than the Innova. Also check out our previous comparison between Maruti Ertiga Diesel Vs Mahindra Xylo 2012 and our detailed coverage on Maruti Ertiga – Pictures, Price, Features, Variants and Details. For latest updates and comparisons, do sign up for our free email newsletter and like our official Facebook Page.